POWERPLUS HAMMER DRILL 38MM 1050W POWP3030: This 1050W hammer drill is just what you need for strong hammer drilling, chiseling or for chisel rotation. It produces up to 3780 strokes per minute with an impact force of 10J and it drills holes up to Ø 38mm in concrete or stone. The speed itself is adjustable from 0 to 480min-1. The SDS max type connection allows a fast and tool-free chisel change. The soft grip gives you maximum comfort and control. The depth stop comes in very handy for pre-set hole drilling. 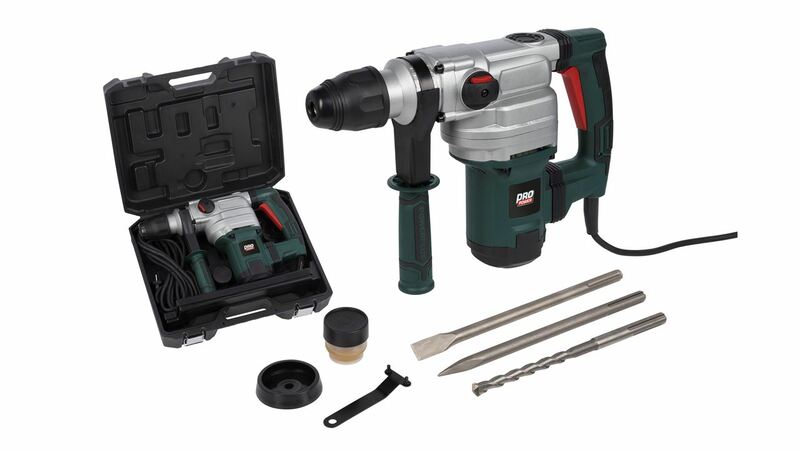 The hammer drill is equipped with a removable auxiliary handle that can be fitted to suit both right-handed and left-handed DIYers. The POWP3030 is delivered with a dust cap, 1 drill, a flat chisel and a pointed chisel.